Subatomic Studios’ Fieldrunners Attack! will appeal to all strategy fans, but tower defense lovers may feel disappointed because the game is far different from its predecessors. It is very similar to the current-gen mobile base-building/strategy titles that lets players build bases, upgrade key structures to increase resource production and raid other players’ bases for loot and rewards. A power station is the heart of a tower. Without this building near it, a tower won’t function and will remain idle. A tower placed within a power station’s range becomes active and starts attacking any enemy units that come within its range. A blitzkrieg on power stations can quickly disable towers powered by them. Before targeting power stations, make sure you have more than one heroes unlocked. For starters, a Yellow Jacket/Metal Rush combo is pretty good in destroying power stations quickly. Razing a power station takes less time than destroying individual towers placed close to it, which is why you should target the former. Before deploying units, you will have a few seconds to scan the enemy base to locate power stations. Tap each power station to know the number of towers that supply power to them. Many players use power stations as decoy, or may power two or more towers with two power stations placed around them so that if one is destroyed the other power station will still supply power to them. There will be power stations and towers near them at the edge of the enemy base. Choose that power station + tower target that’s isolated from the rest and deploy your heroes very close to the power station so that they start attacking it straight away. Every player is asked to select an environment just after a mini-tutorial ends. 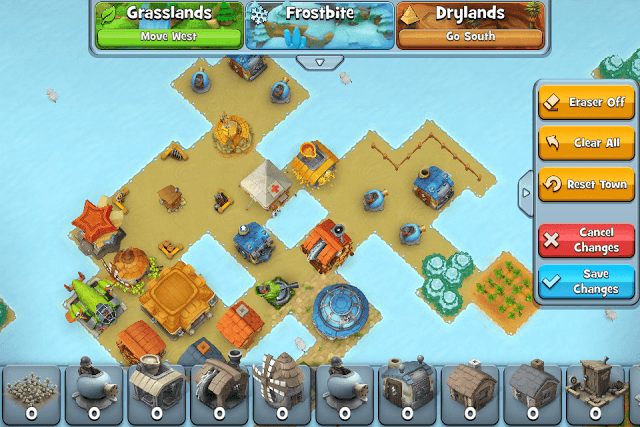 There are three main types of environments: Grasslands, Frostbite and Drylands. Besides their aesthetic value, these environments also provide boosts to certain heroes. For example: The Yellow Jacket gets a stats boost when deployed in desert regions whereas Metal Rush receives a stats boost when dropped in forest regions. To know the list of heroes and the environment boost they will get, tap the “Heroes” button at the lower-left corner of the screen to access the “Hero Collection” screen. You will notice a small icon at the upper left corner of a hero’s portrait pic. A green leaf suggests Grasslands boost. Yellow pyramid suggests Drylands and snow flake icon shows Frostbite. So if a green leaf icon is shown above a hero portrait, then that hero will get a stats boost when he is deployed on a base built on Grasslands. Focus on destroying buildings that have stars above them. These are basically resource buildings. Destroying half of these starred buildings will fulfill the first victory condition, i.e. “50 Percent Pillaged”. You will receive half of the resources and some keys/trophies. Destroying all starred buildings will let you collect all resources plus a few keys/trophies and this fulfills the second victory condition, i.e. 100 percent pillaged. Finally, destroying the enemy HQ fulfills the third victory condition. You will get the remaining trophies and keys. Target only starred buildings. Destroying other buildings would be a waste of time as starred buildings contain resources. Achieving the first victory condition (50 percent pillaged) is easy. Try to fulfill all 3 victory conditions to loot all trophies and keys from enemy. receive any resources. You must destroy all buildings that have a star above them to get all resources. Destroying all HQ does not automatically get you resources. Now that you know about victory conditions and starred buildings, you should consider protecting your starred buildings. Food Granary, Wood Mill, Gold Refinery, Warehouse are those buildings that will have stars above them when your base will be under attack. Your opponent will try his best to destroy them first. While the first line of defense should be walls surrounding such buildings + towers guarding them, you can also consider creating obstacles for enemies by placing buildings like the farmhouse, miner shack, loot transport, laboratory and other non-starred buildings around your starred buildings. This will not give easy access to ground units. Try to make it difficult for them to reach starred buildings and using the edit mode (more on this in the next section) can be very helpful in designing your base. You can also consider upgrading power stations to increase their range so that more number of towers can be built around them. Make sure to build a backup power station (and increase its range) so that if one gets destroyed the other will be able to power it. Moving buildings and towers from one place to another is easy – Just long-press a structure and drag it to a desired area. However, this won’t allow you to “design” your base properly. Thankfully, the game has an easy “edit” mode that gives you a bird’s eye view of your entire base and lets you neatly map out your town. To access edit mode, tap the drawer located at the right hand side of the screen. It’s just above your “Warlog”. Now tap the pencil icon. In edit mode, you can also switch to a different environment, clear your recent design and reset your town back to its original state. The top-down view gives a clear idea as to where your structures are and where they can be moved. You can even pinch-out to zoom-out and pinch to zoom-in. To move a structure, you will have to long press, hold and drag it to the desired location. Basic tower that can destroy most ground and air units. It has a pretty long range, but the attack’s not as strong as other towers like the Railgun Switch. Can rip through armor and can easily take out fast-moving cycles. However, it can easily be destroyed by enemies in large numbers. Yellow Jacket, who commands soldiers, can be deployed to destroy it. Nuke Tower launches missiles that deal a huge AoE damage to troops. Can be very effective against soldiers. However, fast-moving vehicles such as the cycle and flying units can easily destroy it. Deploys troops. Soldiers appear every after few seconds and shoot enemies that move into range. You can send heroes that command cycles to quickly demolish barracks if you want to stop soldiers from attacking your troops. Best defensive structure to protect your towers from enemy attack. Place a fortification to defend a tower. It will take any damage directed at the tower. Can be very dangerous if deployed in large numbers. They can target ground and flying units. Soldiers can destroy the railgun switch in seconds. However, they are very vulnerable against flamethrower towers and advanced switch towers (nuke towers). Long-range units. Can be of immense help if you want to demolish power stations and starred buildings from a distance. RPG units can target flying units and ground units. Can only target land units but can be quickly destroy power stations and starred buildings. Flame Towers are vulnerable to tanks. Cannon towers can easily destroy them. Cycles (Mobikes) are extremely fast-moving units that can destroy nuke towers and barracks in seconds. They can target only ground units. Another long-range unit that can be used against power stations and starred buildings. But a nuke truck will have a hard time destroying fortifications (they protect towers). It can target only ground units. Deploy it if you want to destroy buildings and tanks. However, it has its flaws and can be easily destroyed by missile towers, RPG and basic soldiers. You can upgrade these units at the laboratory. However, you will have to unlock units by upgrading the Research laboratory. Heroes command these units. For example: Metal Rush commands tanks and Yellow Jacket has soldiers under his command. This is a no-brainer, but building walls can make it somewhat difficult for your opponent to infiltrate your town. 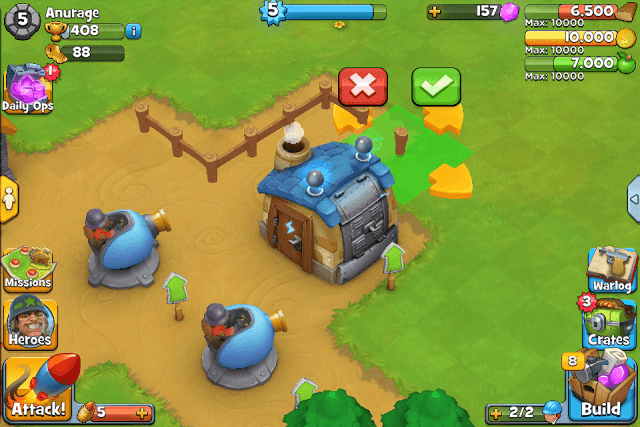 Most troops will first have to destroy walls before they can enter your base. They can’t shoot over walls. Surrounding your entire base with walls is probably a good idea, but make sure there are towers positioned in such a way that their range covers walls as well. Towers will take out enemy troops one by one while they are busy destroying walls. A sturdy wall will not be easy to destroy, and the more time it takes to destroy a part of a wall, the better the chances are to eliminate troops one by one. So don’t forget to upgrade them to increase their hit points. When building walls, don’t forget to pinch-zoom. It will make it easier to build them around your base. 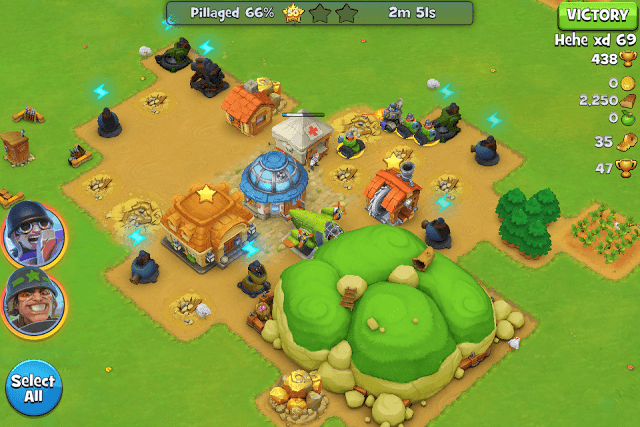 In Fieldrunners: Attack, you will get a few seconds to scan the enemy’s base before deploying their heroes. In these few seconds, you can easily scan the enemy base for vulnerabilities and towers isolated from others. If you spot a soft target in an enemy base, with fewer towers guarding that spot, try to deploy your heroes very close to your tower. You will have to drag and drop your heroes near the towers/power stations in such a way that they will start attacking them immediately after being deployed. Look for the yellow dot when dropping heroes as yellow dot suggests that your units can be dropped in that area. A red dot would mean units can’t be dropped. When dropping outside the base look for the yellow dot. At first, a power station can supply power to a maximum of two powers, but it can extend its range if you upgrade it. Upgrading a power station will let you place more number of towers around it. To know its range, just tap a power station. You can also press the “info” button to access a screen that will show the current health as well as the tiles it covers to power towers within its range. An upgrade guarantees an increase in the number of tiles it can cover. Upgrading a tower not only increases its range but also boosts health. At first it may take a few seconds to heal your troops after a grueling battle, but as you unlock more heroes and increase units that come under their command, healing all of them will take some time. To reduce healing time, upgrade the Hospital building. So you have unlocked new heroes, but can only deploy a max of 2 heroes at a time? This is because you haven’t upgraded the Deployment camp. It is a tiny creaky wooden house, but upgrading it will allow you to deploy more heroes in combat. It requires wood, so make sure you collect wood from the wood mill, build the lumberjack cabin to increase production and build the lumberyard to increase the storage capacity because you will be needing lots of wood to upgrade the deployment camp. Normally a barrack is activated when it is attacked or nearby towers attacked. But I noticed that sometimes whenever I find a new opponent before starting my attack I notice that the barracks already started making troops like automatically…..how is this possible and how do I make my barracks automatically start even before the enemy attacks? Did you ever figure this out. I am looking for an answer also. Could be a bug. There are quite a few complaints regarding barracks automatically spawning before you launch an attack in appgrooves.com. Please help me find out how to buy a shield. Without shield I am defeated by enemy attack. I have noticed that shields are automatically enabled when you don’t play for hours, and this usually happens after an enemy attack. When you open the app after a few hours, you will find the shield icon and the hours (14 or 15 hours) remaining beside it. No one will be able to attack you, so make the most of the shield’s time to make your base stronger. However, it will be disabled if you attack someone. The shield icon is located just beside your name, on the upper-left corner of the screen.